The first crocuses opened on February 3 this year, and the Wood Frogs hit full chorus on February 5. Meanwhile, the human chorus of "this is a crazy winter" just gets louder and louder. However, take a look at the graph at the top of this page, showing average February temperatures at our closest major weather station for the last 64 years. (We're actually a zone colder than them, but the trends are mostly the same here.) Isn't it interesting to see that January 2012 is only the 13th warmest year during that time period? This post is in no way related to global climate change, in case you're curious. No single data point (and no comparison to the past 64 years) proves anything in that respect. 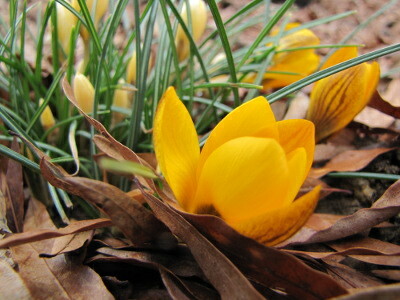 My thesis is --- our weather is always erratic, so enjoy the crocuses when they come! I transplanted some of our little beauties into our forest garden island so I can watch them out the kitchen window. I suspect no one else gets so much mileage from a few little bulbs. Our chicken waterer allows you to leave home for the weekend without worrying about your flock. Did you see the revised plant hardiness map? Zone 7 is moved closer to us. The older bulbs are up here in NJ. New bulbs we put last fall are just starting, but there will be 100s. Joey --- I did see that, but couldn't remember if we used to be in zone 6a or 6b.... I noticed that Mom has been moved to zone 7, though. I've been reading various blogs that mention the way climate change will impact gardeners, and I think it's a pretty tricky subject. The highs and lows are both likely to increase, so I'm not sure whether someone who used to be in zone 6 and who is now in zone 7 can get away with planting more warmth-loving perennials. If it wasn't such a depressing problem for native ecosystems, I would find it a fascinating thought problem. Anonymous --- Interesting to hear the difference between new and old bulbs! These are all old bulbs from about six years ago, many of which have turned into clumps.